Our offer includes several predefined implementation packages designed for shop owners with different requirements concerning implementation time and budget. For demanding customers who expect an individual approach, we offer completely personalized implementations. On the other hand, thanks to the STANDARD templates you can, without any extra charges, immediately launch your store. Our offer includes several predefined implementation packages designed for shop owners with different requirements concerning implementation time and budget. For demanding customers who expect an individual approach, we offer completely personalized implementations. Thanks to STANDARD templates you can start your shop immediately without any extra charges. In each implementation package we can include a turnkey implementation, where our specialists introduce certain settings, thus shortening the panel configuration time. Our Project Manager will oversee the project from start to finish and ensure timely implementation. What is the implementation package? We are a SaaS system designed for professional shop owners. We therefore try to adapt to your needs both in terms of scope and budget of a project. We offer you professional additional services which together make up a comprehensive implementation for your online store or its redesign. To provide the most professional service at this stage, we propose the so-called implementation packages. Each implementation package is an hourly package at a promotional price, under which we guarantee the implementation of a fully functional store in accordance with the arrangements made. Depending on your budget, you can select a package with more hours, in order to spend part of your hourly budget on training or data import. Regardless of the chosen implementation package, the functionality of the system remains the same - the graphics version does not affect the subscription plan either. Guarantee of completing the shop within the package - we allocate and re-allocate hours during the project, so that within the established budget a functioning store is created. Expected completion date consistent with the current queue of orders. Buying individual hours can take a little longer. Project Manager - one person identified by name and surname will watch over all the works and deliver the store within the agreed time and scope. You are the Project Manager of the implementation. You can flexibly establish what we can do for you and what you prefer to do yourself. You can be sure that you will receive a fully functioning store at a predictable cost and time. The most comfortable scenario. You save your time. It requires knowledge and time. The most difficult scenario. You do not incur any charges other than installation and subscription. Within this package you can freely choose one of the available graphic templates, and we will publish it in your online store. The package does not include any working hours of our specialists. If you would like to introduce changes to your shop you can always commission additional works to us or enjoy a free implementation, doing all the work yourself . The STANDARD package is ideal for stores that want to start selling fast or employ their own webmaster. The package contains 25 working hours of our implementation specialists. As part of this package, you can get a tailor-made shop with the best navigation adjusted to your customers. As a part of the implementation we can prepare a graphic design of one subpage - the home page. A typical BASIC implementation involves selecting one of STANDARD templates and adjusting a graphic design according to your guidelines. The package contains 50 working hours of our implementation specialists. This package is a compromise between affordable price and the ability to customize the look of your store. You can use the package for graphic works, where we can prepare a project of two subpages with graphic design tailored to your requirements. Here we can perform a comprehensive implementation, where you can get an online shop with individual graphic design based on the selected Standard template together with additional services like products and customers import , preparing auction template, initial training or logo design . The package covers 90 working hours. Within this time, developers can prepare a shop with very attractive graphics and advanced layout. As part of the package we can prepare a project of three subpages - the home page, the product list and the product card with the possibility of designing more subpages. This is an optimal choice for companies that do not have unusual design requirements, but expect comprehensive implementation with an individual project, data import and introductory training for employees . Implementation in the SUPREME package is recommended for shops looking for custom and comprehensive solutions. As a part of the package we can prepare a project of three subpages - the home page, the product list and the product card with the possibility of designing more subpages. Within the package we can perform necessary configurations, data import, training and also design a mobile application . As part of an individual implementation, we can implement a project that goes beyond prepared, predefined proposals. The price of the package in the INDIVIDUAL OFFER depends on the scope of comprehensive services that we set individually with each customer. Therefore, if you are planning a non-standard integration in addition to launching your store or you would like to make individual changes to our system, use the INDIVIDUAL OFFER. By ordering IdoSell Shop you can be sure that you will receive the highest quality product ready to use. Our implementations stand out with an individual approach and comprehensive care. At each stage you cooperate and contact with a dedicated specialist. In addition, each shop (does not apply to STANDARD ) has a supervisor, who will be responsible for its operation, introducing reported changes and advising on design and updates of your store. In the order form you choose one of the available implementation packages for your online store. However, you can order it at any time of cooperation in order to do a redesign or when after the initial period of using the STANDARD template you want to order the individual graphics for your site. Remember that this choice does not limit your creativity . Any time you can buy additional working hours of our specialists and realize your visions. The offer of our competition accustomed you to the fact that the more you pay at the start, the more features your online store has. IdoSell Shop is completely different. We operate in the Open SaaS™ model, so your system always includes all functions and abilities and the only thing you pay for in addition to the implementation package is the time specialists spend on launching your online store. It's an expense that pays off because they have over 15 years of experience. This creates a better interaction of your store with customers and save your precious time and money , which you would spend on commissioning work to third parties. IdoSell Shop is a system in which the appearance and interaction of a store can be completely arbitrary. Our proposals for ready to use templates (STANDARD) are aimed at every entrepreneur who wants to launch a professional online store at the lowest cost possible and start selling. However, it is up to you and your budget how much the store will be different from what we offer for a start, free of charge. 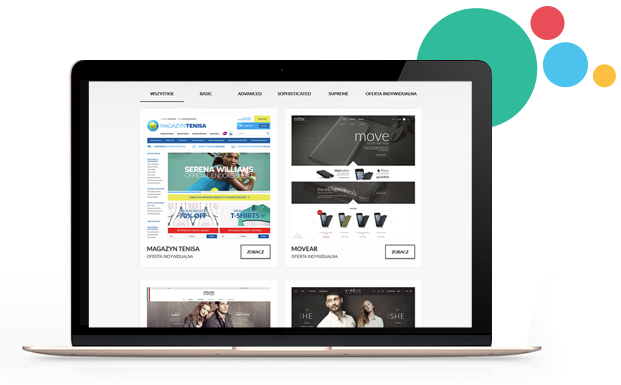 You can use the experience of our graphic designers, who implemented hundreds of online shops for our customers or do the project yourself and leave coding to us. If you have experienced and competent webmasters, you can code the template yourself (before the decision ask sales department about this opportunity). When you get bored with the look of your online store, change your layout freely whenever you feel like it. Changing the graphics does not affect the data collected and does not cause the store to stop working. If you are one of those sellers who strive for continuous excellence and maximizing conversion, use the unique functions of A/B Tests and cooperating with a store supervisor, create an online store that will be perfect. Shops in the gallery are divided by implementation packages. Graphic designs were created within implementation packages. Graphic designs are a good reference point for verifying your needs, budget and taking into account additional works such as data import , configurations or training, which can be ordered at any time.